The goal in the distributed monitoring environment that I will describe is to offload the overhead (CPU usage, etc.) of performing service checks from a "central" server onto one or more "distributed" servers. Most small to medium sized shops will not have a real need for setting up such an environment. However, when you want to start monitoring hundreds or even thousands of hosts (and several times that many services) using Nagios, this becomes quite important. The purpose of the central server is to simply listen for service check results from one or more distributed servers. Even though services are occassionally actively checked from the central server, the active checks are only performed in dire circumstances, so lets just say that the central server only accepts passive check for now. Since the central server is obtaining passive service check results from one or more distributed servers, it serves as the focal point for all monitoring logic (i.e. it sends out notifications, runs event handler scripts, determines host states, has the web interface installed, etc). Okay, before we go jumping into configuration detail we need to know how to send the service check results from the distributed servers to the central server. I've already discussed how to submit passive check results to Nagios from same host that Nagios is running on (as described in the documentation on passive checks), but I haven't given any info on how to submit passive check results from other hosts. In order to facilitate the submission of passive check results to a remote host, I've written the nsca addon. The addon consists of two pieces. The first is a client program (send_nsca) which is run from a remote host and is used to send the service check results to another server. The second piece is the nsca daemon (nsca) which either runs as a standalone daemon or under inetd and listens for connections from client programs. Upon receiving service check information from a client, the daemon will sumbit the check information to Nagios (on the central server) by inserting a PROCESS_SVC_CHECK_RESULT command into the external command file, along with the check results. The next time Nagios checks for external commands, it will find the passive service check information that was sent from the distributed server and process it. Easy, huh? So how exactly is Nagios configured on a distributed server? Basically, its just a bare-bones installation. You don't need to install the web interface or have notifications sent out from the server, as this will all be handled by the central server. Only those services and hosts which are being monitored directly by the distributed server are defined in the object configuration file. The distributed server has its enable_notifications directive set to 0. This will prevent any notifications from being sent out by the server. The distributed server is configured to obsess over services. The distributed server has an ocsp command defined (as described below). In order to make everything come together and work properly, we want the distributed server to report the results of all service checks to Nagios. We could use event handlers to report changes in the state of a service, but that just doesn't cut it. In order to force the distributed server to report all service check results, you must enabled the obsess_over_services option in the main configuration file and provide a ocsp_command to be run after every service check. We will use the ocsp command to send the results of all service checks to the central server, making use of the send_nsca client and nsca daemon (as described above) to handle the tranmission. The script above assumes that you have the send_nsca program and it configuration file (send_nsca.cfg) located in the /usr/local/nagios/bin/ and /usr/local/nagios/etc/ directories, respectively. After the distributed server finishes executing a service check, it executes the command you defined by the ocsp_command variable. In our example, this is the /usr/local/nagios/libexec/eventhandlers/submit_check_result script. Note that the definition for the submit_check_result command passed four pieces of information to the script: the name of the host the service is associated with, the service description, the return code from the service check, and the plugin output from the service check. The submit_check_result script pipes the service check information (host name, description, return code, and output) to the send_nsca client program. 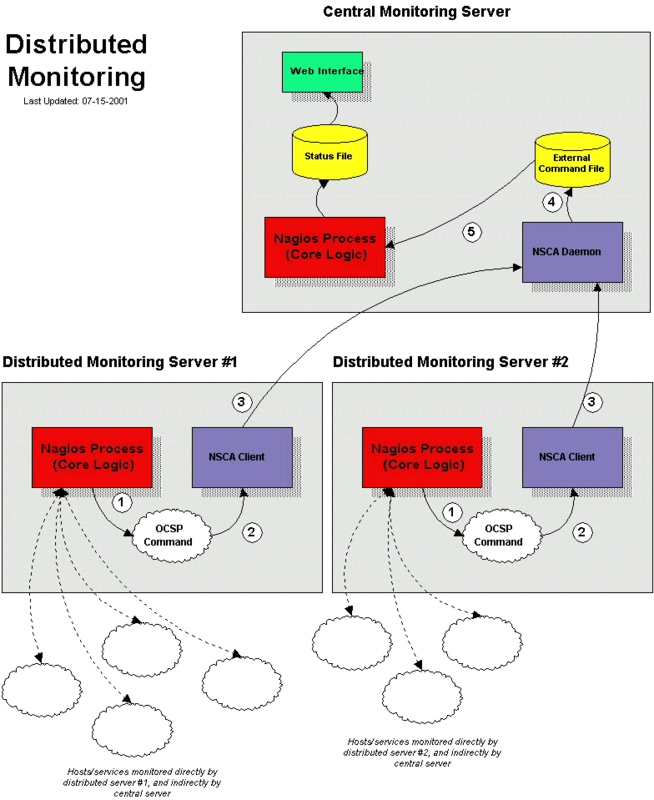 The send_nsca program transmits the service check information to the nsca daemon on the central monitoring server. The nsca daemon on the central server takes the service check information and writes it to the external command file for later pickup by Nagios. The Nagios process on the central server reads the external command file and processes the passive service check information that originated from the distributed monitoring server. The central server must have service definitions for all services that are being monitored by all the distributed servers. Nagios will ignore passive check results if they do not correspond to a service that has been defined. If you're only using the central server to process services whose results are going to be provided by distributed hosts, you can simply disable all active service checks on a program-wide basis by setting the execute_service_checks directive to 0. If you're using the central server to actively monitor a few services on its own (without the aid of distributed servers), the enable_active_checks option of the defintions for service being monitored by distributed servers should be set to 0. This will prevent Nagios from actively checking those services. For all intensive purposes we can say that the central server is relying solely on passive checks for monitoring. The main problem with relying completely on passive checks for monitoring is the fact that Nagios must rely on something else to provide the monitoring data. What if the remote host that is sending in passive check results goes down or becomes unreachable? If Nagios isn't actively checking the services on the host, how will it know that there is a problem? Nagios supports a feature that does "freshness" checking on the results of service checks. More information freshness checking can be found here. This features gives some protection against situations where remote hosts may stop sending passive service checks into the central monitoring server. The purpose of "freshness" checking is to ensure that service checks are either being provided passively by distributed servers on a regular basis or performed actively by the central server if the need arises. If the service check results provided by the distributed servers get "stale", Nagios can be configured to force active checks of the service from the central monitoring host. The check_freshness option in the service definitions should be set to 1. This enables "freshness" checking for the services. The freshness_threshold option in the service definitions should be set to a value (in seconds) which reflects how "fresh" the results for the services (provided by the distributed servers) should be. The check_command option in the service definitions should reflect valid commands that can be used to actively check the service from the central monitoring server. Nagios periodically checks the "freshness" of the results for all services that have freshness checking enabled. The freshness_threshold option in each service definition is used to determine how "fresh" the results for each service should be. For example, if you set this value to 300 for one of your services, Nagios will consider the service results to be "stale" if they're older than 5 minutes (300 seconds). If you do not specify a value for the freshness_threshold option, Nagios will automatically calculate a "freshness" threshold by looking at either the normal_check_interval or retry_check_interval options (depending on what type of state the service is in). If the service results are found to be "stale", Nagios will run the service check command specified by the check_command option in the service definition, thereby actively checking the service. Remember that you have to specify a check_command option in the service definitions that can be used to actively check the status of the service from the central monitoring server. Under normal circumstances, this check command is never executed (because active checks were disabled on a program-wide basis or for the specific services). When freshness checking is enabled, Nagios will run this command to actively check the status of the service even if active checks are disabled on a program-wide or service-specific basis. command_line	/usr/local/nagios/libexec/check_dummy 2 "CRITICAL: Service results are stale"
When Nagios detects that the service results are stale and runs the service-is-stale command, the check_dummy plugin is executed and the service will go into a critical state. This would likely cause notifications to be sent out, so you'll know that there's a problem. At this point you know how to obtain service check results passivly from distributed servers. This means that the central server is not actively checking services on its own. But what about host checks? You still need to do them, so how? Since host checks usually compromise a small part of monitoring activity (they aren't done unless absolutely necessary), I'd recommend that you perform host checks actively from the central server. That means that you define host checks on the central server the same way that you do on the distributed servers (and the same way you would in a normal, non-distributed setup). Passive host checks are available (read here), so you could use them in your distributed monitoring setup, but they suffer from a few problems. The biggest problem is that Nagios does not translate passive host check problem states (DOWN and UNREACHABLE) when they are processed. This means that if your monitoring servers have a different parent/child host structure (and they will, if you monitoring servers are in different locations), the central monitoring server will have an inaccurate view of host states. The distributed server is configured to obsess over hosts. The distributed server has an ochp command defined. The ochp command, which is used for processing host check results, works in a similiar manner to the ocsp command, which is used for processing service check results (see documentation above). In order to make sure passive host check results are up to date, you'll want to enable freshness checking for hosts (similiar to what is described above for services).